It's been just over a week since the event, and I can say it was great to be there. I arrived on the Friday in London, staying just round the corner at the Holiday Inn. I had my best friend Hayden with me, and we were looking forward to such an exciting event the next day. We still had the rest of Friday to get through first. We took to an exploring of the immediate area, looping around the block opposite to where we were staying. We took in the numerous shops around, and popped into a CEX for a look at the things they had for sale. While we didn't buy anything, we saw Simpsons Hit and Run was on sale for PS2, and I'm pretty sure I spotted most of the seasons for Family Guy. There was also a Power Rangers Ninja Storm DVD, which I found very odd as I've never even seen Power Rangers sold anywhere before. Well, the DVD's at least. Around 17:15 we headed to Chelsea Peri Peri Grill, which was right next to the Holiday Inn. The food was nice, and after some spicy chicken and fries we returned to our room. There was still at least a quarter of the day left though, and our drinks supply was low. So we headed back out. First to Argos, where we picked up Cluedo. Then to Poundland where I picked up four drinks, as did my friend. Thank the stars there was a two for one pound offer going in all the shops along that road for cooled drinks, as I lost count of how many we picked up over the three days. Returning to our room, we start up an incredibly simple game of Cluedo - thanks to me reading the instructions wrong and thinking you had to announce all the cards you had that the other person was questioning about. Needless to say, we passed a bit of time before calling it a day. Thanks to the free Wi-Fi, we were able to get on our mobile devices to watch whatever we pleased while lying in our beds before going to sleep. Despite being a Power Rangers fan, I've never seen the original series, so that's what I was watching. Saturday arrived, and we were up at 08:00. Fully ready an hour later - breakfast being included with our stay - we queued up for the event. The person who joined behind us had a phone hooked up to a radio-like loudspeaker, and was playing SEGA:Sonic Radio. There was a bit of a wait, but with the music and the cameras running up and down the line, it went quick enough. Once inside we headed straight for the merchandise stall. The main thing I wanted was a poster, so a poster I bought. I had planned on going back sometime, but the rest of the day came and went without another visit there from me. The event opened at just over 11:00 with the usual Boozerman animation, minute countdown video - this year featuring members of the Sonic community - and greetings from the founders Svend Joscelyne and Adam "T-Bird" Tuff. Once that was over, there was a small gap until Mike Pollock came on stage for his Q&A. We decided to stay for that, so while sat we looked over at everything else. The queue for Sonic Mania was already going strong. Once the Mike Pollock Q&A started it was getting interesting. Not least because he was asked about how he got the role of Ella from Sonic X. Never Mind The Buzzbombers was next up, and as that's always an entertaining event, we stayed where we were. And it was an entertaining event. Johnny Gioeli was the guest star for one side, and Mike Pollock for the other. Both sides were backed up by a member from the audience. Team Svend and Team T-Bird battled it out over a very entertaining mask round and a fired up quick fire round, where Adam brought in Matt from Tails' Channel to secure another victory for the team. Which they did. There was a break before Jam With Jun! so we decided it was time to try Mania. The queue was quite long, though not as long as the signing queues got, and we passed the time with Hayden having The Logo Quiz on his phone and both of us trying to guess the logos. This is something we did during most of the downtime. During the queueing, the animation showcase started up. First up was Sonic the Hedgehog in Brief by Frobman. I enjoyed this one as it gave me a feeling of The Magic Roundabout in the way it was narrated. The next one up was from Sonic Paradox. The Vector's Knickers Collab is roughly the same as Knuckles' Briefs was, in that the jokes are formed on a singular main character other than Sonic. 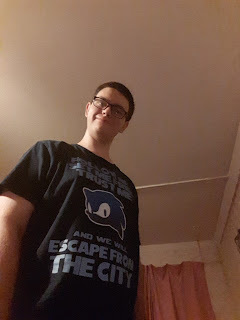 It was another great show by Sonic Paradox, and while not fully finished with all the content, it still provided plenty of laughs. Now, no recording of footage was allowed to allow the line to run smoothly, and I didn't think to even snap a picture of the game from within the line. Needless to say, I enjoyed my time with it. I played the new stage Studiopolis, though couldn't properly enjoy it as there was a bit of an audio problem. That being I was hearing Green Hill Zone's theme over the top of everything else. I've heard many a tale of a demo station glitching out somehow, so I wasn't too concerned. The game itself ran smooth. I got the hang of all the controls very easily, and my limited knowledge of playing the classics transferred to this game as well. I can't fully compare physics and things like that, but the level felt large without actually being so, which is something I've always admired about the classics. Starting out went well, though my timing in certain areas was off and I soon ended up on the lowest path. It was a good time to test the drop dash then... Except I didn't. The move is very easy to pull off in the game, but I just kept letting go of the button too early. All except one time. It felt a good move, sort of like the bounce from Adventure 2 except hitting the ground propelled you forward and not back up in the air. I managed to pull off a few neat jump cuts with the spin dash, and managed to get through the level without losing a life. When it came to near the end of the level, I found a fire shield. Needless to say I didn't use it. Except as a shield. I know the fire shield comes with the ability of a forward charge, but I felt I didn't need to use it. The level design itself is great. Multiple routes within routes, though never complicated. A good number of ramps and loops and other set pieces to get through the levels, and I already knew about the references within the level so was looking out for them. This game is great from what I have experienced from that one level, and I'm hoping we see more levels in the future through more trailers. Which we more than likely will. Now I was going to try Sonic Boom: Fire and Ice, but Jam With Jun was so close and I wanted to be near the front. So when Hayden had finished with his gameplay [he played through Green Hill and said his experience was great as well] we got to the front and sat down. In fact, we stayed sat down throughout the entire Jam With Jun, even when nearly everyone else was stood up. It was great to listen to the guitar riffs of Jun, and Escape From The City at the end with everyone singing was just great. Before Jam With Jun was another animation showcase. First with another showing of Frobman's Sonic the Hedgehog in Brief. The new animation was Sonic CD in 4 Minutes by Roger van der Weide. It had some creative moments in it, with Sonic using the Past sign to get around various obstacles and stopping Eggman before he manages to build his machines during bosses. Deciding on a spur of the moment to get in the line for the Crush 40 signings, it was a long queue before we got to it. It had already reached the end of the hall and curved around and headed straight back for the signing area. And even more people joined after us, which meant it had started making its way back to the other end of the hall. During the wait, the Q&A with Yuji Naka and Takashi Iizuka took place. There was a few interesting things said, though no hints of the future. Sonic Mania's trailer was shown before this, with the announcement of a CRT mode that makes the game appear as though it was on an old TV. Also during the wait in line was the Happy Birthday Sonic segment, where Naka and Iizuka were brought back on stage with the Sonic mascot to be presented a cake in honour of the 25th anniversary. Straight after the Sonic Jump event started, where people had to play Jump Fever by actually jumping, and the people who contributed most to the total score won prizes. Once that had finished, despite only getting halfway through the line for the signings, we felt it would be much better to get a good space ready for the final event of Crush 40's live performance. To me, getting a signature is just a bonus. Seeing them perform live is the real experience. Even if just seeing someone live. It was easy to duck out of the queue since we'd reached the top half of the hall, and after circling right the way around the venue we got to roughly the same place as we were when watching Jam With Jun. The art contest winners were announced, then the finalists of the cosplay contest were brought on stage. There were some great costumes, and even a Star Wars-Sonic crossover cosplay. The Perfect Chaos cosplay won, which I felt was fair. It looked great, and had moving appendages as well. 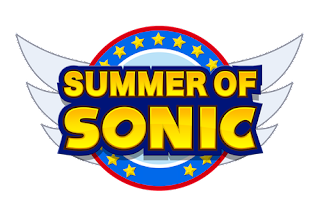 Last up was the Summer of Sonic Signoff before the finale event. The founders received some signed artwork for their hard work over the years after a video that had been put together of fans saying what Summer of Sonic meant to them. A big thank you went out to everyone, all the special guests - past and present - and everyone who attended with a credits-like video playing out. It also featured all the Kickstarter backers who made this year's event happen. Then was the finale. Club Sonic gave various tunes to clap along to, and near the end Team Chaotix and Endless Possibility to sing. And those two songs got a lot of people ready for Crush 40. Upon each "Team Chaotix!" the crowd just pumped it out, and the same could be said for "Endless Possibility" every time that came up near the end. Club Sonic got a huge cheer to finish on, and Crush 40 got an even louder cheer when announced they'd be up next. And when they eventually came on after a pause in between, the atmosphere went into overload. Opening with Open Your Heart, the crowd were just continually enjoying it - cheering and singing along. Jun even swapped guitars from his Sonic to his Shadow for those songs related to Shadow. Some of their non-Sonic related songs such as One Of Those Days even featured in the set list. On Live and Learn - the second to last song - the Sonic Twins, two females [think they were sisters] cosplaying Jet and Wave were allowed on stage to sing with Johnny. Any fans dream, I'm sure. The last song was What I'm Made Of. One of their best songs, and one they always seem to end on. After the event closed with the last song, it was back to Holiday Inn. And there we stayed, except for the few minutes in the Co-op to pick up more drinks. While that picture above was taken back at home a week after the event, that is the shirt I had on throughout the day. The little time remaining of Saturday was spent planning an adventure for tomorrow. Sunday opened with a walk to Hammersmith, where we hung around for a while before checking out GAME in King's Mall. After a while, we caught a bus over to Hyde Park, where we walked from the west to the east of it and into the main London city. Checking out Buckingham Palace and Big Ben, we called it a day and headed down into the underground. After a drink and a bit to eat in a pub, we headed back to Holiday Inn where we spent the rest of the day watching The Simpsons and the Patagonia Special of Top Gear on the TV. Getting back on the Monday went smoother than getting to London, not least because we managed to catch earlier trains than planned [except our pre-booked hour long journey between Watford Junction and Birmingham New Street]. The weekend as a whole was great, though the highlight was definitely Summer of Sonic. The event is great, and there's always a lot to do and see. While I didn't get talking to anyone while there, I could see that everyone around was enjoying themselves. If another Summer of Sonic was to happen, I would definitely go again. And despite the fact that I said getting signatures was just a bonus, I would definitely try to get some. Perhaps even just getting to meet them. That's one thing I really should have done this time. There were loads of other special guests, and while I'm not following any of the Sonic comics, it would have been good to meet some of them. And if the event does happen again next year, Mania will already be out and Project 2017 will more than likely have its full name revealed and demo pods out in the open for events. And it'd be good to hear more live performances.